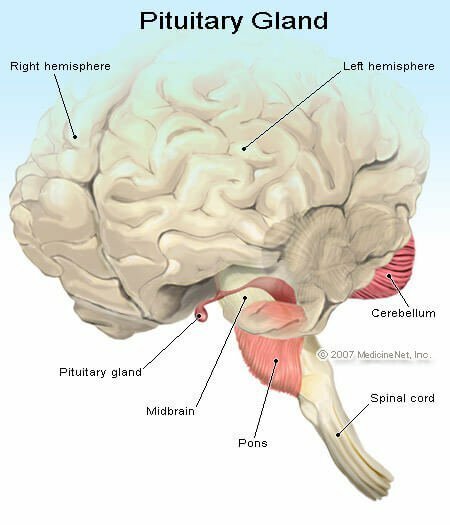 Pituitary gland: The main endocrine gland. It is a small structure in the head. It is called the master gland because it produces hormones that control other glands and many body functions including growth. The pituitary consists of the anterior and posterior pituitary. The anterior pituitary is the front portion of the pituitary. Hormones secreted by it influence growth, sexual development, skin pigmentation, thyroid function, and adrenocortical function. These influences are exerted through the effects of pituitary hormones on other endocrine glands except for growth hormone which acts directly on cells. The posterior pituitary is the back portion of the pituitary. It secretes the hormone oxytocin which increases uterine contractions and antidiuretic hormone (ADH) which increases reabsorption of water by the tubules of the kidney. Underproduction of ADH results in a disorder called diabetes insipidus characterized by inability to concentrate the urine and, consequently, excess urination leading potentially to dehydration. The urine is "insipid" (overly dilute).